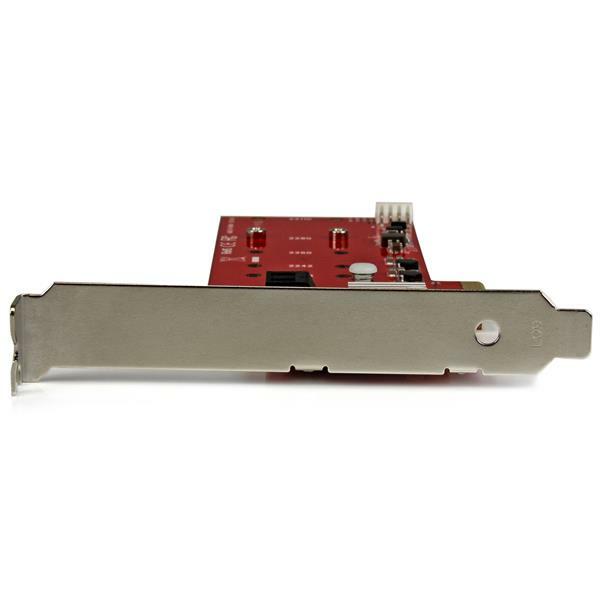 This M.2 SSD RAID controller card lets you install two M.2 NGFF (Next Generation Form Factor) drives in your desktop computer. 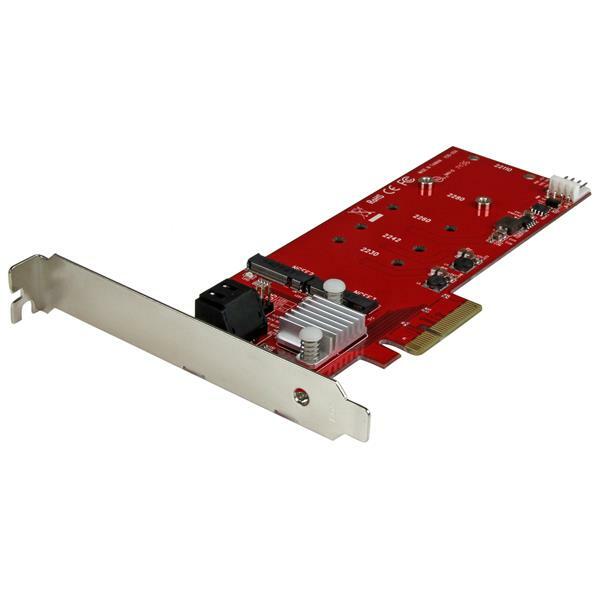 The card also features two SATA III (6Gbps) ports and supports hardware RAID. Now, you can merge the speed and compact size of M.2 solid state drives (SSD) with the storage capacity of traditional hard disk drives (HDD). This M.2 controller card lets you take advantage of the size and performance benefits of NGFF SSDs. M.2 drives are smaller than typical platter drives or mSATA-based SSDs, so you can install them in small form-factor PCs and servers, or in tighter areas within your computer case. When you couple the card with an M.2 drive, you can give your computer’s performance a noticeable speed boost. By installing your operating system on the M.2 drive, you'll have faster access to the files you commonly use, and you can continue to use your higher-capacity platter HDD for bulk storage. If you need a scalable, internal storage solution that you can count on, then this card can help. It supports a range of RAID configurations (RAID 0, 1, and 10), giving you multiple ways to expand your storage, improve your computer’s performance, or to create data redundancy backups. Because the M.2 card supports port multiplication, you can connect up to four drives to one of the card’s SATA ports. With a built-in port multiplier, you can install up to seven drives (two M.2 SSDs, five SATA drives) in your computer through this single drive controller. You can rest assured that your M.2 SATA drives are compatible with the card. It supports the most common drive sizes, including 22110, 2280, 2260, 2242 and 2230. For more versatility, the card also supports hybrid drives. 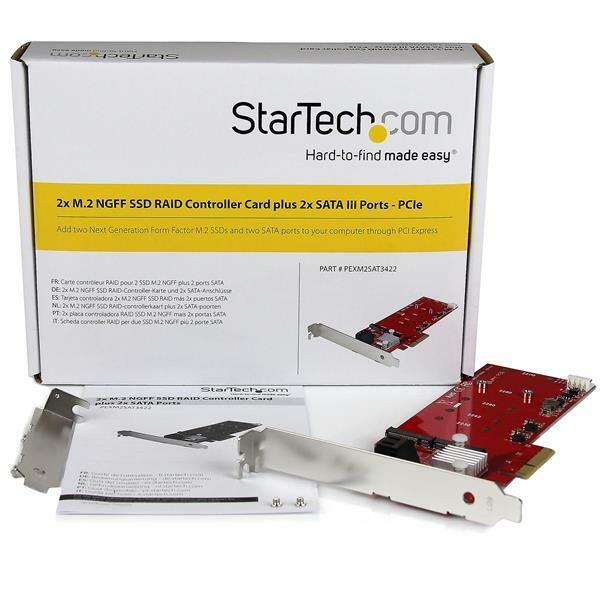 The PEXM2SAT3422 is backed by a StarTech.com 2-year warranty and free lifetime technical support.